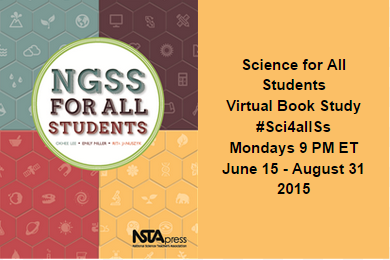 Please share your classroom stories through text tweets, pictures and/or video to #Sci4allSs on Twitter during the 2015-16 school year. Let's share the journey of NGSS implementation through our classrooms! Below are the archives of all the Monday Night Chats in order from the most recent. Chat Archive 7/27/15 Chapter 15 - At the 30 min point in the chat, we switch to Google Hangouts On Air to have a live discussion with the authors of the book. The video is embedded below.